Marvellous thing that it is, there are down-sides to the internet… it’s a massive repository of information, but it is up to the individual reader to determine the validity of what they read. The same is true, of course, of books, but with the printed word, it’s much slower and resource-demanding to circulate information – whether true or false. On the internet, however, any purported ‘fact’ can go viral and appear to be ‘truth’ by mere repetition. Discerning users of social media are painfully aware of this. It is always a good idea to check that story your ‘friends’ all posted on Facebook before you give it further credence by posting it yourself. There are lots of sites where you can check out offers/stories/video links to see if they are genuine: try Hoax-Slayer or Snopes. But my advice is to be skeptical… do you REALLY think that Land Rover are going to give away two brand new vehicles via Facebook? Of course they aren’t, it’s just someone trying to get your contact details (at the very least). However, here are sites that we instinctively trust because we think that the parent institution/company is legitimate. The British Broadcasting Corporation (BBC) is probably the sort of organisation that one could consider to be reliable. I was a little surprised this morning, therefore, to read a ‘fact’ on the BBC website that I knew to be incorrect. The piece I was reading was about William Gillette… you probably haven’t heard of him, but I knew quite a bit about the man before I read the article. He was the actor who created the ‘look’ of Sherlock Holmes as we generally envisage him (or at least we did until Benedict Cumberbatch came along and transformed the character in the recent BBC series)… you know, deer stalker hat, hooked pipe, fancy dressing gowns. Well, this morning there was a story about the fact that a film of Mr Gillette performing as Sherlock Holmes had been found that was previously considered lost forever. Of course, there was lots of info about Gillette, including reference to the grand ‘castle’ he had built in North Carolina. Well, I’ve visited Gillette Castle and, at the time, it was definitely in Connecticut! I messaged the BBC with the correction and within an hour the change had been made. Now, this may only seem like a minor thing – what does the location of a ‘castle’ matter one way or another? But it got me thinking. I often believe what I read because I assume the information to be from a reliable source. But if the BBC makes mistakes like this – what else might they be getting wrong? I’m not saying that it’s deliberate, just that when you have a huge website and churn out dozens of stories every day, how much time is actually spent checking and researching them? A book lasts a long time and so getting the contents right is important, but a web page can be changed from one minute to the next – so how much emphasis is put on getting everything right first time? Food for thought next time you read a report in any of the media, but especially the internet. 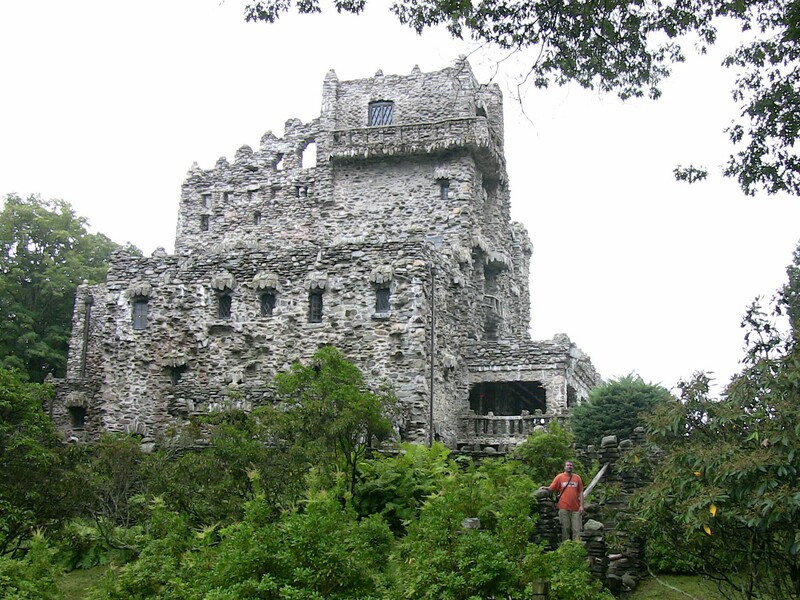 … oh, and if you are ever in Connecticut, go and visit Gillette Castle – it’s fascinating and the staff are wonderful. I have been sceptical about reports ever since we watched a journalist stand in the middle of a river talking about a flood when the river had barely reached the top of the bank, but she had to televise a flood and the only way to do it was by pretending the river was a flood. Can’t say I’m surprised… I guess we need a reminder now and then, though! Here’s the thing: the internet offers you an opportunity to publicise the errors. Even if you’re never actually going to do something about it, you could if you wanted to! It’s not often we can get away with correcting our elders like that. There is the expectation that reporters and staff writers will ensure their ‘facts’ are right before publication but sadly we know it not to be true. They just hope sloppy workmanship won’t be noticed. Did they have the courtesy to thank you for the correction? It’s good and bad – like most things! I quite like the fact that I can give my own version of the truth here on my blog. One day I might compile something about Clarice – my mother has copious notes. Nick Robinson and the infamous currency question during the Referendum debate was clue enough. Oh well. Ah well, bias… now that’s a whole other story! The points you make here are important reminders! I think part of the problem (not with the example you gave so much) is that the media are in heated competition with each other and trying to get the scoop. I’ve seen internet headlines about breaking news–the number dead in the hostage situation in Paris, for example–and then, when I refresh the screen, the story has been pulled because it was incorrect. The old “take it with a grain of salt” axiom is so important!